I'm excited to be introducing you to our wedding photographer today! 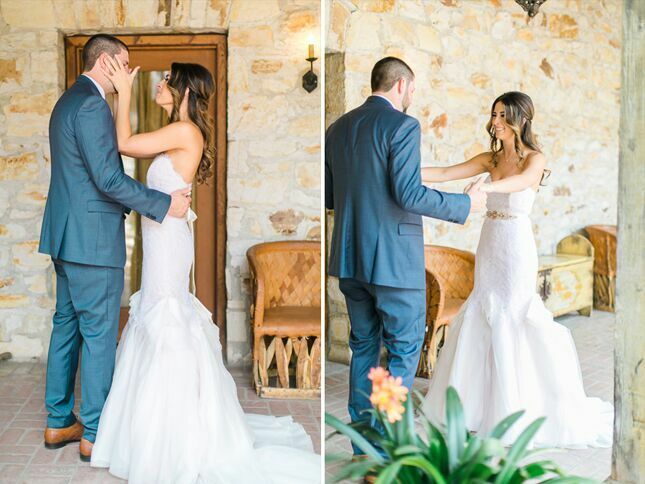 Meet Danielle of Danielle Poff Photography. She's a friend of mine (we met back when she shot one of my good friend's weddings) and I'm thrilled she gets to capture our big day in September. 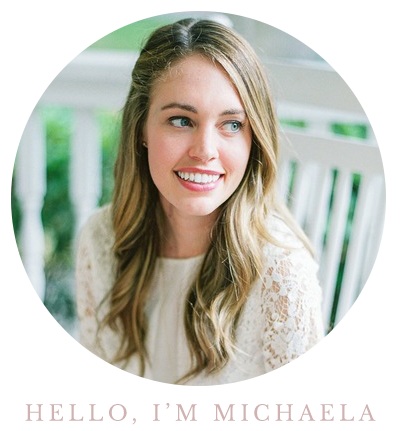 As a way to introduce her, share a bit of our planning process and what's important to us, I knew I wanted Danielle to share a bit about The First Look option brides and grooms have on their wedding day. You can read all about it, then scroll down to learn about what we're doing! 1. What is a First Look? 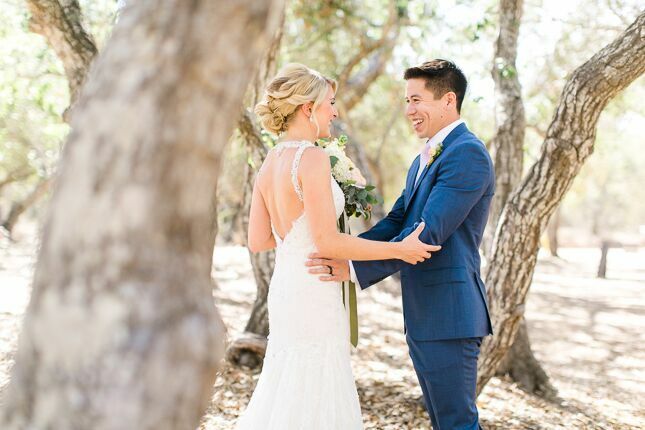 A First Look is when the couple sees each other before the ceremony. 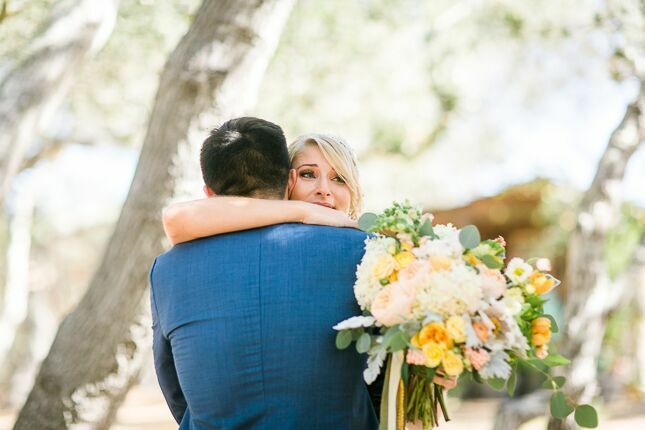 It’s a private moment that allows the freedom to feel your emotions without having to do it for the first time in front of everyone watching you at the ceremony. 2. What's the experience like? I think it’s a fun experience! The First Look itself is usually pretty quick, 5-10 minutes, just you and your significant other. After that is over, you get to spend more time with each other and your friends. If you felt stressed prior to seeing each other, that anxiety is now gone before your ceremony and you can feel more present in the moment. 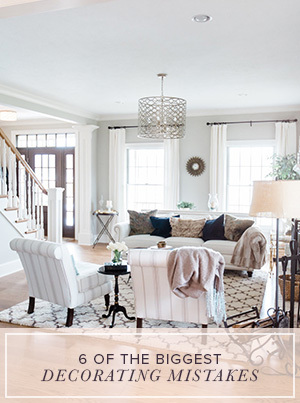 The First Look is more of a how you want to spend your day. Do you want to be together for longer on your wedding day, attend cocktail hour, and get photos done prior to the ceremony? Then a First Look is for you! 3. 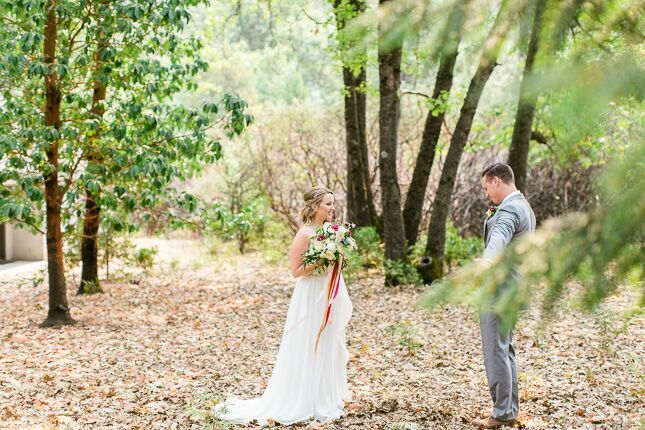 What are some benefits to choosing a First Look? 1. 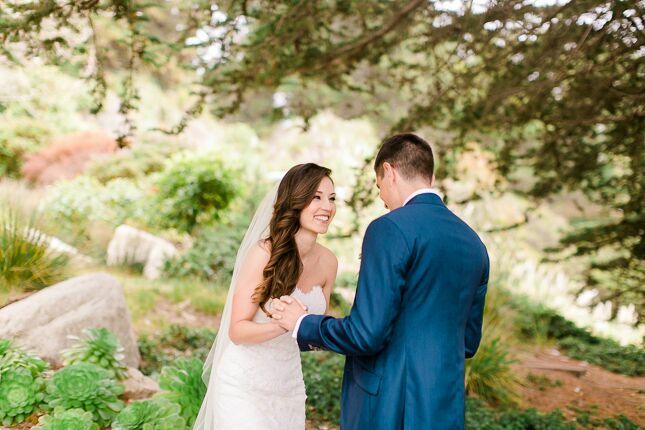 With doing the First Look we get to roam around your venue, free of guests, and use every backdrop we want for photos. If you do not do the First Look, we may have limited space to take photos because guests are taking up that space during cocktail hour. It’s great to be able to utilize all of your beautiful venue for all photos, because you picked this venue and you love it! 2. Something I hear from every single couple who doesn’t do a First Look is, “I wish we could go to cocktail hour,” or “cocktail hour looks really fun, I wish we could be there to hang with our guests.” And I agree, you should be at cocktail hour! It’s your wedding, your guests are there to see you, you paid for this day, you designed it, you deserve to cherish every moment possible as the day goes by so quickly. 3. Ladies, your hair & makeup is fresh for photos since we do photos right away. 4. You get to spend more hours of your wedding day with your significant other, which I think is what a wedding is all about. 5. A First Look timeline gives us a bigger buffer for anything running late, meaning we have more time options for photos if needed. 4. What about the walk down the aisle? Will we loose that emotion from the groom? The number one argument about not seeing each other before the ceremony is to preserve the significance of the walk down the aisle. Many think that a First Look will take away from that moment. The walk down the aisle is totally significant. But the First Look can ever take away from that. 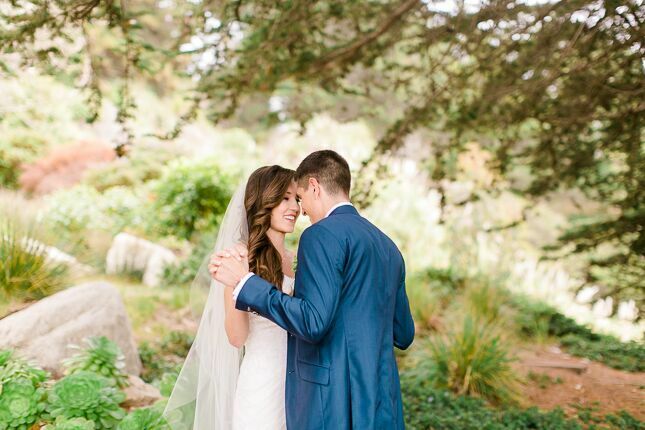 Nothing can ever change the fact that you are walking down the aisle to marry the man of your dreams. In talking to my couples who did the First Look, that moment is still powerful, emotional, and meaningful, and the moment is even more amazing because all of the nerves have dissipated. 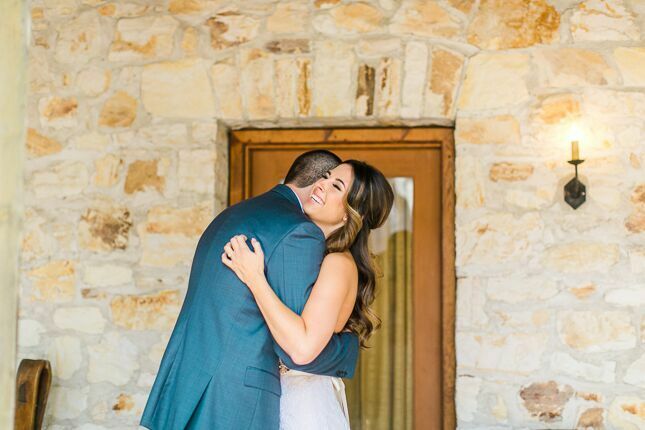 They have already laughed, cried, and hugged out their nervousness, so they are free to focus on the wedding ceremony instead of the anxiety of seeing each other for the first time in front of 100+ guests. Below are some shots of the groom while his bride walks down the aisle. 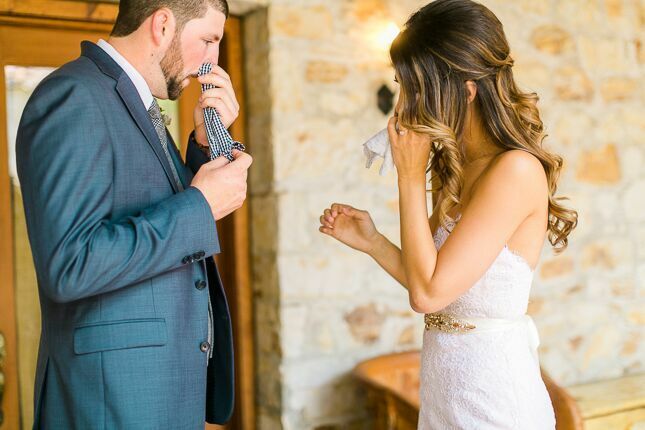 If you scroll up, you'll see this same couple did a First Look, and yet the emotion is still there during these special moments, too! 5. 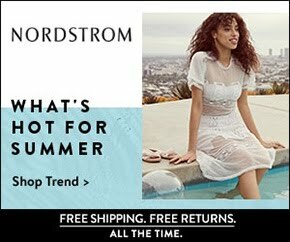 Why should couples consider the first look? 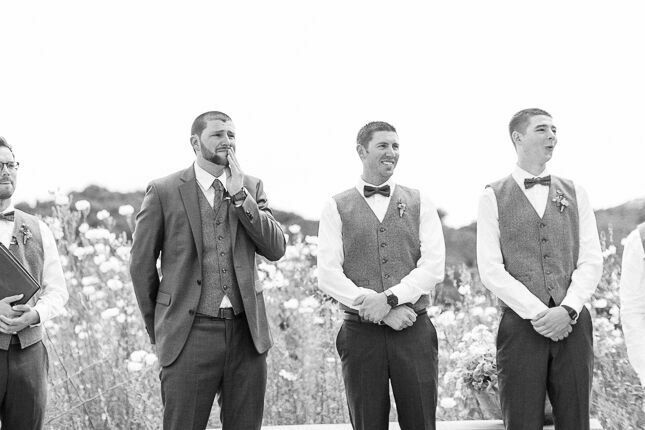 If you have a big family: doing the First Look will allow us enough time to get those family picture done after the ceremony without also having to squeeze in wedding party pictures and bride and groom pictures. If you have a big wedding party: it’s a good idea to do the First Look. Gathering up large groups after the ceremony, when they know they can drink, eat, and party, is always more challenging then gathering them up before the ceremony when all they are doing is relaxing. 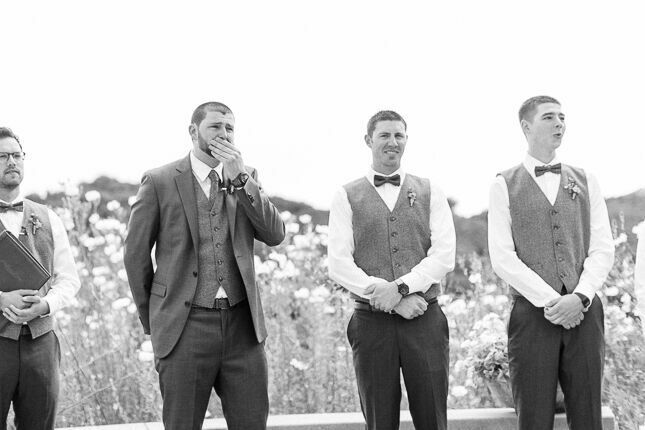 If you know your bridesmaids and groomsman can get rowdy: consider doing a First Look. They will be way more cooperative before the ceremony compared to after. Believe me! 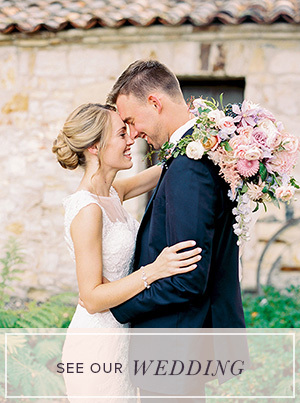 If you think you'll be stressed or nervous on your wedding day: a First Look is a GREAT way to ease the stress because you’re allowing yourself a lot more time for pictures and the ability to talk to your significant other more. If pictures are high on your list of important thing on your wedding day: then the First Look will give you the most pictures and most options for natural light. 5. If I'm a traditional bride (or my family is strongly encouraging we skip the First Look) will you still work with me to create beautiful photos? Have I made a wrong decision to forgo the First Look? It’s 100% ok if you don’t want to do the first look. One of my many jobs as your photographer is to educate you so that I can do my job to the best of my ability and give you amazing photos. I’m totally fine with you opting out of a first look, just as long as you know your options and you chose what you wanted knowing all the information. You’ll get beautiful photos either way. 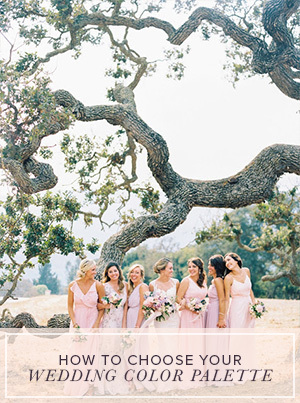 I’d say doing the First Look is more about the way you want to spend your way wedding day, so rest assured pretty photos will come no matter what! McCann and I are definitely partaking in a First Look. I may not seem like it, but I do have some anxiety ;) I know I won't be able to feel comfortable or like myself until I get to see my groom on the day of our wedding, so first and foremost, we are doing a First Look to calm our nerves and get the chance to spend a few moments together. I can't wait to show him my dress and do a twirl for him! 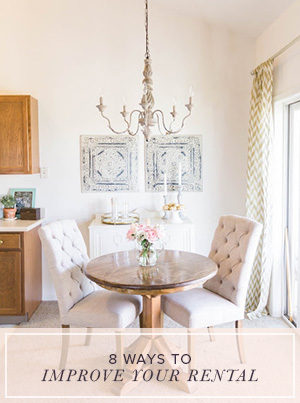 I know plenty of friends who opted to forgo the First Look and lean towards the more traditional way of doing things, so there's no problem with that! This is just the way we are excited about doing it. I'd love to hear your experience! I was dead set on not having a first look, but now that I've read this I'm second guessing myself! Thanks for sharing the pros and cons! 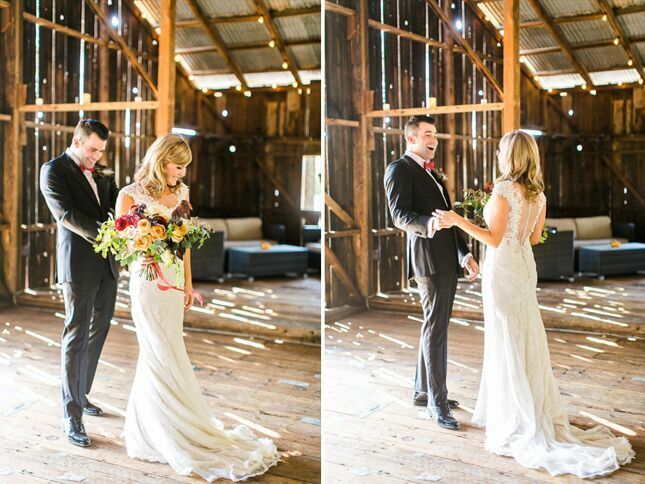 As my officiant put it, the first look and the walk down the aisle are two distinct moments. 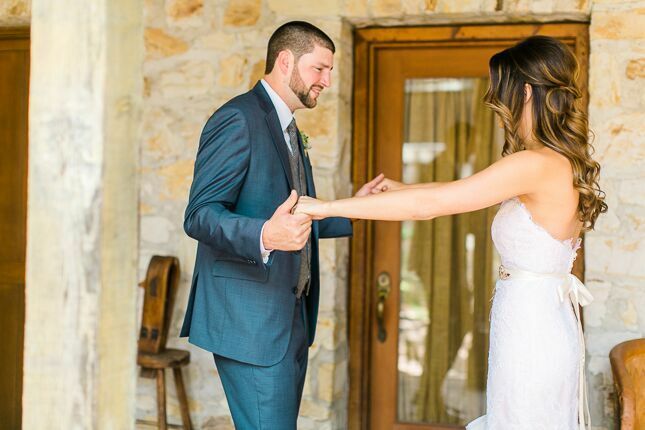 Walking down the aisle will still be incredibly emotional and special, regardless of whether you do a first look. I was sooooo glad I did a first look. We got to take our time with pictures and it was nice to have just a private moment. It was also important to me to have my wedding party enjoy the cocktail hour. I'll be the lone dissenter. I didn't do a first look, and I have never had any regrets about it. In fact, I am still glad I didn't do it. (I have been married 17 years.) 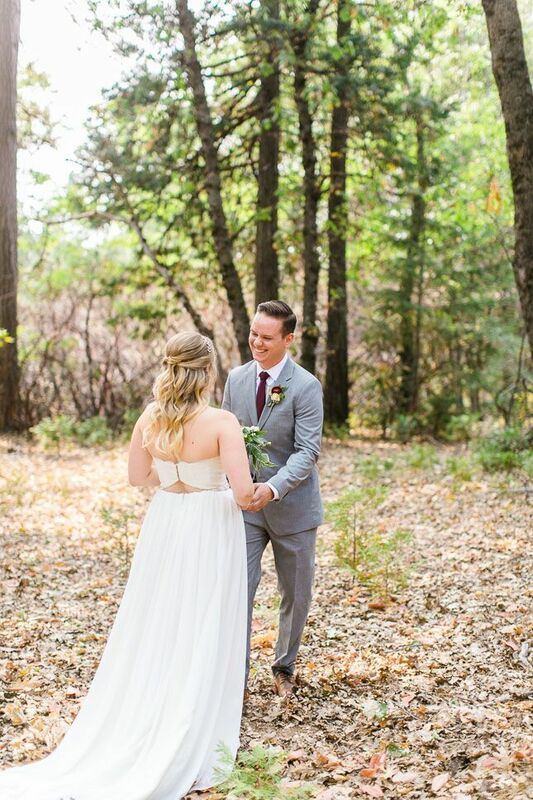 The reaction my husband had when I walked down the aisle and he saw me for the first time is one of my favorite moments of the entire day. Although there were lots of people in the chapel with us, at the moment it was just the two of us and no one else existed. Past, present and future all in one. It was so special.